Chef John McFadden has leapt from working kitchens to supplier mode. Deftly, as he moves about the industry, he leaves a legacy behind him of leadership and kindness. As with all top chefs, his life has been illuminated by hard work and attention to detail. Now, older and wiser, he’s looking for better balance. He may just have found it, and a new way, for him, of giving back. You have a big new role as Business Development Manager at Select Fresh Providores. How did that come about? “I was judging at Chef of the Year at Food Service Australia – and out of the blue I received a phone call from Dominic Barba, CEO of Select Fresh Providores who asked me if I was interested in being BDM for Select Fresh. Dom has followed me in my career – Dom and his team created this new role for his business, it gave me the chance to consider my career path. To create from scratch is a great opportunity. But daunting! Where did you start? “I began and am still learning everyone’s role, from buyers to pickers, packers, drivers dispatch, sales, admin, farmers, growers and the list goes on. We are currently in the process of setting up a test kitchen to host lunches and dinners, to promote new produce as it comes into season, liaising with farmers and growers, giving a lot more back to our industry. There’s a human element to our business, our produce and service is paramount, highlighting that creates engagement and a real connection – there has to be a face and story behind what we do, a purpose – if you don’t have a face of the business relating to people, produce and service then you lack the care and passion to drive forward. “In winter it can be tricky and challenging with variety, frosts etc. I guess the hardest part about getting access to new produce in the first place is about timing and ripeness – new season plums for instance might be ready, but firm, not the best eating quality. Recently we hosted a truffle evening at Acre Eatery, with Gareth (Howard) as host with chefs in the industry discussing produce and our search for perfection. It’s these kind of events that bring people together, that, for me, is what this industry is about. Normally, these guys and girls are always busy – so to spend some quality time together, sharing knowledge as well as war stories, is a valuable gift and allows for a mutual understanding from both sides. So where did your big life in food begin? 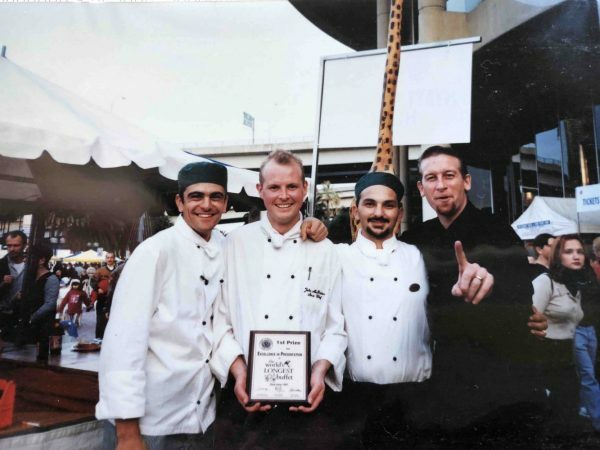 It wasn’t always John McFadden, head chef. “I was interested in cooking from the age of 10 – it was something that just captured me, and somehow I always knew that it’s one of the few careers that you can take anywhere in the world. I was good at sports and played representative rugby league as a junior. But the lure of the kitchen was strong. I started work at 12 after school, riding my bike to work, watching the chef, and within a few weeks I was given a job washing dishes and by 14 I was given the keys to the restaurant, I’d run a section at lunch. It was Dominic’s Manor – and I loved every minute. Then I moved on to Not Just Pizza and learnt everything about pizza, it had French influences as well, so I was also doing classic dishes, like Chateau Briande. Was snaffling that first apprenticeship easy? “Trying to get a job in the mid 80’s was hard. I probably saw 80 – 100 restaurants, and finally got a job at a Chinese restaurant that sat 500 people. I was the only westerner in the kitchen, everyone spoke Cantonese! It was tough, but I loved it. My TAFE day was considered my day off, I worked 6 days a week for $100. Because I was doing Chinese at the work place, and French cooking at TAFE, I would cook at home to practice what I was learning, I ended up doing dinners for 20 people at home. My parents and grandfather were so supportive I was very lucky, my grandfather and parents would pick me up from Hamilton TAFE in Newcastle and drive me home. Why? Because I finished late at 10pm – I was on the central coast and I was still so young my family didn’t want me catching public transport late at night. “I worked at the Chinese restaurant, Lantern Palace, for 2.5 years, and when Peppers on Sea at Terrigal opened, I got really excited and applied as a second-year apprentice.They took me on and placed me as entremétier under the chef Bruno Cerdan in the fine dining restaurant, `La Mer`. A Frenchman, at the top of his game, Bruno took me under his wing and taught me what he knew. “I recall one day, Bruno stood over my shoulder when I was turning vegetables and said, “you’re going to be here a long time”. I finished my apprenticeship and Bruno moved to the Windsor Hotel and asked me to come down and work for him as a commis. It was fine dining, by the time I was 20 I’d had 3 years in fine dining. What did that bring to your skill set? “I moved to the Fairmont Resort in the Blue Mountains, before Lillianfels was built. It was considered then the place to go, I worked in the a la carte restaurant as a demi-chef. I started doing competitions, entering salon culinaires, won awards and was soon approached by a friend who was working at Hayman Island, so I jumped ship and headed to the islands. Sydney is a big jump from the culture in an island resort. How did you find that? “Island life is very different to the mainland, I was young enough to really enjoy it, the biggest shock was getting back into the pace of the city again. It was hard and fast compared to the island. I started at The Boulevard Hotel, which was 4.5 stars, but for some reason, I found it wasn’t a perfect fit for me, so I left and landed a job at the ANA Hotel, now Shangrila, with Jacky Ternisian. 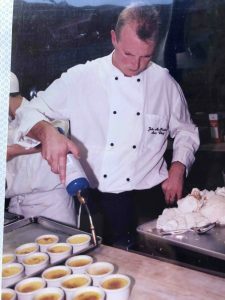 I startedas junior sous-chef at Brasserie restaurant, where we had a team of 25 chefs, I was 23 years old! How was that training managed in such a busy environment? “For that kitchen I was the dedicated trainer for the entire team, I had to do lesson plans, presentations and training and performance evaluation – looking critically at other chefs in the kitchens. The way people learn is different so we had to adapt our training to the individual – learning to really see the person first before the skill. Also having that connection and understanding about the individual on a personal level – whether techniques would vary and adjust appropriately to the skill set. 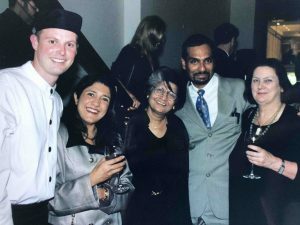 John at The James Beard Foundation in New York, with Carol Selvah-Raja, Raj and Wendy. A huge achievement. After 2.5 years as number 2, I wanted a chance to be number 1. Daniel Bucher was executive chef at Hyatt Regency at Kings Cross and had a restaurant called XU bistro, he offered me a role to run it. That’s a huge step up, and a big placing of faith in you. What was their driver? “The day I started, the GM showed me a review where they were rated 6 out of 20, I was given free rein to pull it into gear. I had the full support of Daniel and Alistair McCracken the GM and in 6 weeks I lost the majority of my brigade being 15 chefs! What was your dream for XU? Wow! James Beard Foundation? Almost a Holy Grail for most chefs. Any problems with the delivery? I’m sure those accolades didn’t come easily. “I was working 6 days a week, from open to close. The restaurant was pumping, and we were doing 180 covers a night, the team was firing but I found myself spending more time out of the kitchen in the social world. It was a real eye opener. I needed to get back in the kitchen, with my team. 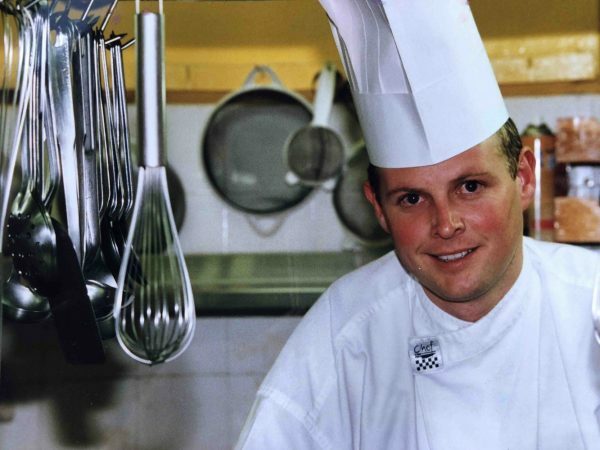 I was 25 and the Hyatt property changed, Millennium Copthorne took over their own property – they wanted a hotel in Sydney and me to stay and roll out the XU Bistro concepts across the globe. I had dinner with the CEO, and I watched as the top 3 managers resigned, so that made it hard to move on with the idea. Those 20 hour days are madness, aren’t they? What was your solution? Big learning curve for everyone, I guess. And from there? “Brien had 5 venues at the time, I saw a silo kitchen culture which needed to be changed, and proposed to Brien and Michelle Guberina, General Manager, that we use the Art Gallery as a training and breeding ground for the business, so all staff knew what standards to expect, then farm them out. I worked there for 10 years, we grew from 5 to 30 properties – it was great to see our chefs and teams develop over the years, the diversity of the business was dynamic and challenging in a good way. Being invloved with the product development team for Emirates in Dubai was amazing. We set up menu planners, mobilized new sites, built teams, recipe cards, costings, all the basics that build a solid foundation including a food safety management plan. It astounds me today how many businesses lack those fundamentals, particularly if they are planning to upscale. During all this time my wife was battling breast cancer, Brien’s support was invaluable, particularly when she lost her battle. Brien sold to AIH, there was a lot of reshuffling and merging, the settling in period took a couple of years, and I worked with Trippas White for 6 more years. I recall a special project I was given for 12 months which was managing wages across the entire business, reducing payroll by $1million over a year, that was without pain for staff, it was just working with managers and Head Chefs, structuring rosters, based on mutual respect and business acumen. Interestingly I was part of a panel for the third and final interview for a new General Manager for The Art Gallery, Karen. I didn’t realise at the time that Karen would become my wife and we now have three amazing children. I am very fortunate and cherish everything Karen and the kids bring to my life. The support and love they give is unconditional and allows me to do what I do. In a way, this was a natural progression for you, wasn’t it? “I guess. I was approached by Pittwater RSL which had just spent $8m renovating their F&B operations to give it the life it deserved, we put in charcoal cooking in the redesign, but the board was considering putting in an outside operator model as we were close to opening and things stalled after 9 months, so I decided it was not for me and moved into consulting and fortunately the Pan Pacific Hotel Group, who owned Park Royal Hotels, took me onboard. We introduced a work placement program with high school students still at school to have exposure to industry, something I’m a big supporter of. Along with rolling out new menus, food safety programs and the list goes on. There must have been some big challenges for you then? “It was interesting in managing the business dynamics and menu roll out. It’s definitely the largest menu I have ever been a part of, although in saying that it also brings its challenges. It also gave me the opportunity to see what I really want to do with my hospitality career. I didn’t want to be another statistic in hospitality, so when the opportunity came to work with Select and have a family life, and inspire my team, I jumped. So what’s your advice for young kids coming up through the ranks, or even just considering the industry? “Where did I start? Someone gave me a chance, an opportunity, we need to nurture our young talent – my credo is that you’ve got to give, it’s all about giving, if you’re not prepared to give you’re not going to get much. So don’t demand it! I love the mentoring I do now with Kenvale Hospitality College, and now I am ambassador for Starshell Students which is anti-cyber bullying. It will be a platform working with education systems, it’s fairly infant but gaining a lot of traction. I love judging competitions and there’s always a learning from that, a benchmark– e.g. at the last chef of the year the entrants were given time to plan, and then in the finals a mystery box, they did better with the surprise of the mystery box. For me, that was really interesting to see the different dynamics – it was a totally different pressure. And for the younger ones? “Do your research, make sure you align with someone who meets your core values, and that there’s respect and mutual understanding there and you can grow and develop within that business. I ask apprentices what’s your development plan? Where do you want to be at the end of the year? The answer comes through feedback, take it onboard, you have to groom your team for success. That’s what our jobs are, it’s simple really. Thank you John McFadden, it will be interesting to see you continue to give back to an industry you love, but which obviously gives you much in return.